Ron Hill of the Bob Bondurant School of High Performance Driving, at the Bondurant display at the Scottsdale Business Aircraft & Jet Preview. Internationally recognized as the leading authority on advanced driver training, Bob Bondurant has been at the forefront of professional driving instruction since 1968. Over 85,000 students, ranging from housewives, racers and celebrities to teenagers, professionals, astronauts and police officers, have learned from Bondurant’s expertise. Included in the elite list of actors who have graduated from the Bob Bondurant School of High Performance Driving are Paul Newman, Clint Eastwood, Candice Bergen, Tim Allen, James Brolin, Gene Hackman, David Hasselhoff, Lorenzo Lamas, Lee Majors, William Shatner, James Coburn, Tom Cruise, Robert Hayes, Dolf Lundgren, Keith Carradine, Scott Glenn and Tommy Lee Jones. 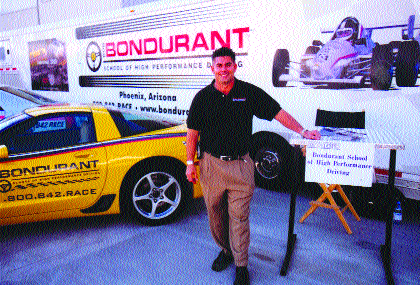 Bondurant grew up in the Westwood area of Los Angeles with a passion for anything on wheels. By the time he was 18, he was racing an Indian Scout motorcycle on the local dirt ovals, and soon moved to sports cars, in 1956, at the wheel of a Morgan. His racing career began to soar in 1959, when driving a Corvette in the Southern California region, Bondurant captured the West Coast “B” Production Championship and the Corvette Driver of the Year Award. In 1963, Bondurant joined Carroll Shelby’s Ford Cobra team. Subsequent wins in the Cobra led to a stint in Europe with the Cobra team to compete for the 1964 GT Championship. Paired with Dan Gurney that year, Bondurant won the GT category and took fourth overall at the wheel of a Ford Cobra Daytona Coupe in Europe’s most prestigious race—Le Mans. Bondurant continued to drive in Europe through 1965, winning seven out of 10 races, and earning the World Manufactures’ Championship for the United States in a Shelby American Ford Cobra. The year also afforded him the opportunity to race Formula One for the factory Ferrari team in the 1965 U.S. Grand Prix at Watkins Glen. Among the highlights of working on the film, Bondurant was responsible for training actors James Garner, Yves Montand and Brian Bedford for their driving roles. The Can-Am series and the United States Road Racing Championship were growing in popularity in 1967, so he joined with Peter Revson for the Dana Chevrolet team. Later in the year, at Watkins Glen, Bondurant’s professional racing career was forced into a three-year hiatus. Aboard a McLaren Mk II, the steering arm broke at over 150 mph, launching the car into a dirt embankment and rolling end over end eight times. Faced with the possibility of never being able to walk again, Bondurant contemplated his future. He had enjoyed his experiences coaching the actors for “Grand Prix,” substituting for Pete Brock at Carroll Shelby’s driving school at Riverside, Calif., and teaching at a number of Sports Car Club of America racing schools. He decided if he had the physical ability, he would take his experience and expert knowledge of driving and start a school to teach others. On Feb. 14, 1968, with three Datsuns, a Lola T70 and a Formula Vee, the Bob Bondurant School of High Performance Driving officially opened its doors at Orange County International Raceway, near Los Angeles. The first week he had three students. The second week there were two students, Paul Newman and Robert Wagner, training for the movie, “Winning.” As technical advisor for the film, Bondurant taught the actors and drove the camera car. In 1970, the Bob Bondurant School of High Performance Driving moved to nearby Ontario Motor Speedway, then in 1973 moved north to Sears Point International Raceway, near Sonoma, Calif. On March 2, 1990, Bondurant’s dream of his own purpose-built driver training center become a reality with the opening of his Phoenix facility. Today, the Bob Bondurant School of High Performance Driving maintains a fleet of Cadillac CTS, Chevrolet Corvette and open wheel Formula cars. Bondurant, as president, continues his hands-on management style and enjoys teaching whenever time permits. The Bondurant School features a fleet of more than 200 specifically prepared vehicles, sedans and open wheel Formula cars. Courses in Grand Prix road racing, advanced road racing, high performance driving, teenage defensive driving, highway survival training as well as custom corporate groups, incentive programs, and executive protection/anti-kidnap courses continue to keep the Bondurant School at the forefront of professional driving instruction. Besides a specially designed 1.6 mile, 15-turn road course at the state-of-the-art facility in Phoenix, the Bondurant School facilities include an eight-acre basic training area for exercises such as accident avoidance, emergency controlled braking, autocrossing and skid car training, and the handling oval, garages, a museum and meeting area, along with administrative offices and classrooms. Bondurant continues to race in selected vintage and historic automobile events, typically behind the wheel of a Shelby Cobra or a Formula One car. He can also be spotted flying his Aerospatiale Gazelle and Schweizer 330 helicopters above the skyline of his residence in Phoenix. For more information, visit [http://www.bondurant.com].